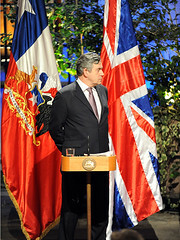 Prime Minister Gordon Brown by Downing Street, on Flickr. I think this analysis is spot on. For centuries, Scotland effectively had cultural autonomy within a political, economic and monetary union called the British Empire. Because of this autonomy, and because almost no Scots spoke English as their native language until recently (Scots and Gaelic dominated for a long time as spoken languages, and English was only used in schools and churches and some other formal settings), their was no threat to Scottishness at all. However, these days it’s getting harder and harder to define what it means to be Scottish. The TV programmes young people watch the most are British (X Factor, Big Brother, The Apprentice, Britain’s Got Talent and so on), the churches are dying out, and Scots increasingly speak standard English with a slight accent — and even that is dying out (my kids are struggling with pronouncing the ‘ch’ in ‘loch’ and the ‘w’ in ‘whale’). Gordon Brown even created a UK-wide football team for the Olympics. I’m surprised how Gordon Brown can see these issues so clearly and yet fail to provide any solutions for them. His article doesn’t suggest any concrete measures — he doesn’t suggest splitting up the BBC into four national broadcasters, he doesn’t think the UK should field four separate Olympic teams, he doesn’t draw up a plan for revitalising Scots and Gaelic. Because Unionists don’t seem to want to do anything to create new distinctive Scottish institutions to repair the “delicate balance between cultural nationalism and political unionism”, I cannot help but conclude that they’re happy to see Scotland merging gradually with England until eventually it becomes just another British region like Yorkshire or Devon. I agree with Gordon Brown’s analysis, and so far as I can see, the only practical solution to the problems he raises is independence. Surely he can see that too?